Starting out - what to do first? Only one account per person, per game server. No automated processes, macros, scripts or other 'non human being' run account activity is allowed. No sharing or giving out your account details to others. No logging into other people's accounts. Attempts to break into accounts, the game, or otherwise disrupt or slow down the game, or server, are strictly illegal. Using bugs or exploits of any kind, or knowing of and not reporting bugs or exploits, is illegal. Spamming your recruiting link, or anything else related to or using our name or site, is illegal. Share the site, but please do so respectfully. No profanity in user names, nameable weapons/ships, or anywhere else on game. Any breaking of the rules can result in punishment, suspension, banning, account deletion, or banning of your entire ISP. Impersonating a game official (Admin, Game Mod, Game Cop, or any variation) will result in account deletion and exclusion from the GateWars-games (Main, Ascended, Quantum, NewGrounds). Users have the ability to choose one of four starting races from StargateWars. They can choose to be (in alphabetical order): Asgard, Goa'uld, Replicator or Tau'ri. Each race offers different advantages for choosing that race, leading to a different set of strategies and gameplay. The races are all equally playable and able to ascend the ranks - if you use your skills wisely! You can change your race at anytime you want, but it comes at a cost (see 'additional account options' section). Note: After ascending (see Ascension Section, below) players can become a higher race, based on their existing race, with a different set of weaponry, bonuses and abilities. The game is turn-based, with turns occurring every thirty minutes. Upon each turn, you generate a certain amount of in-game currency called Naquadah('Naq'), and 'untrained' units ('UU'). You can use Naquadah for everything from training troops to upgrading technology or buying weapons. You must guard this well, for the more Naquadah you have, the more likely it is that someone will try and attack you to take it!. In turn, though, you can use your turns to attack other players, to get their Naquadah. Untrained units are gained from your Unit Production (UP), generate a small income on their own, and are also trainable into the various unit types in the game (see Training for more details). Either on their own, or trained into higher income producing units, these units (and therefore UP) is critical to grow your realm, and should be a primary focus when starting. Another part of the game is either recruiting other players as your officers, joining a commander, or joining/creating an alliance. These in-game relationships can be crucial to your survival, or you can risk being a lone wolf. Each option has different bonuses, advantages and disadvantages, explained in more detail below. When you first start, there are several things to do, and several ways to progress your account. While the options are numerous, a simple yet effective strategy is outlined here. With your few units, you will likely want to train at least one miner, and one attacker (or buy an attack merc). You will want at least one weapon - get what you can afford after training the units. One spy would also be helpful but not necessary. Now - you need more naquadah. Going to the 'attack' screen will give you available targets from whom you can get naquadah - the more you see out the better. You can then either spy on them, to see what defence they have and if your attack is higher than their defence, or you can attack with 1 turn to 'test them out' and see if you can win. If you can, use the full 15 turns to take their naquadah. With your naquadah, you will want to first repair your weapons, then put all or most of it into unit production to increase your growth rate. This is key. You can -optionally - put more into weapons, miners, or attacking units. Build your technologies when you can as well, and -when you are comfortable with how to get naquadah - you can look at upgrading your covert levels too. If you can find a good commander higher than you in the ranking, they will help by providing you income (and hopefully other help) - you can find people looking for officers on the forums, or just by clicking 'make this user my commander' on the rankings/stats screen. An alliance likewise may help, but both of these are completely optional. When you get enough miners such that you do not want to easily lose the naquadah they produce to others, start to build defence and more covert power so you can defend, and avoid easy sabotages. Once you have done the above a few times, you are well on your way! The in-game interface is located in a column at the left of the screen on all pages except the main page. The actual look varies between races, but the functions are the same. The interface also holds some key information, and functions. GameTime: This is the universal, official, SGW game time. Useful when trying to arrange a common time in an international community. Rank: This is your overall rank. The rank is the average of your four distinct ranks (attack/defence/covert/mothership) compared with other players average. The easiest way to climb ranks is to have all ranks as equal as possible, while the easiest way to drop ranks is to 'zero out' one or more individual ranks. Turns: How many attack turns you have to use. Attacking takes from 1 to 15 turns, the more turns used, the greater the rewards and damage. Naquadah: An always visible record of the Naquadah 'on hand' or in the open. This is the Naquadah that can be taken from you on a successful attack. Vault or Bank: This is a 'secret stash' of Naquadah, that cannot be taken on attacks. Clicking the link takes you to your bank, where you can deposit or withdraw Naquadah. Unless your race avoids it, there is a 5% fee for deposits. The type of secret storage varies by race, but the amount it can hold is equal. The bank will hold 1.5 days worth of 'raw' or natural income production. This does not include officer/commander bonuses, defcon or officer income expenses, but does include race bonuses if applicable. See 'calculations' for the exact formula of how much your natural income would be. Next Turn: How long until the next turn update. Messages: A display of how many ingame messages you have. Clicking this takes you to the ingame messaging system where you can read, reply, delete messages. To send a message, you use the 'rankings' or 'attack' link to find the player you want to send to, at which point an option to message them will be presented. If you recieve a message you do not like, you can 'blacklist' the sender, preventing any further messages from that player. (You can also unblock all previous blacklists here). If a single player is blacklisted enough, it alerts the game administration to see if bad language or personal threats/insults are being used, which is illegal (and can result in that player losing all messaging ability, or even banning of account). Note: you can send a maximum of 50 messages per day. Ads/Interesting Links: If a link or ad interests you, please click it. The ads are-in theory- designed to be interesting to you based on the game content, and do help support the site only when clicked. The Command Center or 'base' is the page you see after logging into the game, or clicking 'command center'. User Info, Military Effectiveness/Ranking, and Personnel. 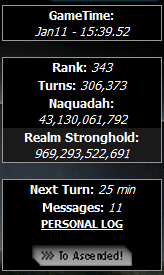 User Info The User Info section deals with your account information, your commander, Technologies you have purchased, while also giving current statistics, including Unit production, available naquadah, income per turn, and total turns. Directly below the data, this section also shows what alliance you are in (or in the process of joining), and the officers you have under your command. Military Effectiveness This section is divided into five distinct scores and rankings: Strike Action, Defensive Action, Covert Action, Mothership Action and Glory and Reputation Score. Beside each one of these is a rank, comparing your power in that skill to that of all other users in the game. Strike Action is a measure of attack power, similarly Defensive Action is a measure of defensive power. Covert Action is a measure of your ability to spy or sabotage other members. Mothership Action is simply the overall effectiveness of your Mothership (likely not applicable until you are powerful enough to command a mothership). The Glory and Reputation Points are used as a measure to determine Ascension feasibility. See Calculations for how each score is determined. Personnel The personnel section deals with your troop and unit counts. It tells you your totals of Attack, Defense, and Untrained troops and mercenaries, spies or covert agents, anti-covert agents, and income producing troops (miners/lifers). There are two levels of attacking and defensive troops - one much more powerful than the other. The names of your troops differ from race to race as listed below. See the Training section for full details on each unit type, and the table below for the generic and race names for each type. Support this site -UPGRADE The option to acquire "supporter status" or 'SS', that opens up some new game functionality. Protection from attack (protected planet treaty or PPT applications) and other bonuses are available here, for real currency (any currency - although the site uses US Dollars (USD) the companies that facilitate the payment convert to your own currency for you). The bonuses/functionality for supporting the site, while giving advantages, are designed such that they do not guarantee winning. It is therefore not necessary to pay to do well in the game. Clicking this option will give full details on all available support packages and costs. Change E-Mail / Password / Vacation Mode Here you can change your email and password. Changing email automatically changes your password, and emails you the new password. Make SURE you enter your correct email, or you will not be able to get back into your account. Changing password does just that, and is recommended periodically for security reasons. Please DO NOT use the same password as other sites, forums, or chat rooms. There have been NUMEROUS examples of forums, chatrooms, proxy servers, and even other game sites, using this information to break into accounts and remove all the goods, or even delete the account. Also - if your msn or IM is the same email as you use ingame, be very careful not to give other people enough information to guess your 'secret questions/answer' as hotmail accounts can be broken into this way. **Vacation Mode Here you can put your account in 'suspended animation' -- for a minimum of 2 days, no maximum, your account 'freezes' ... Nobody can attack you, you do not gain income or units, and nothing in your account changes. Note that PPT (see support site above) is not a realm based time -it is universal time - so that if you are on PPT and then go on vacation, the PPT continues to run out even though your realm is frozen. Change Player Name (#) This allows you to change your player name. By default you have only a limited number of name changes, and when they are gone, you can no longer change your name. Change Race (#) Like name changes, race changes are limited. Changing race is also costly - you will lose all technology upgrades, all 'super' trained units, all currency in your 'bank', all covert/anti-covert agents, and all weapons. You keep your untrained, covert levels, UP level. More detail is available when clicking this option. Delete Account This will remove your account from the game. Please use this option wisely. Recruiting You are given a unique link to use. When someone clicks this link, (and the security number displayed), you are given Untrained Units. They then also have the ability to register for the game, with you as their commander. If they register, you get even more untrained, and them as an officer. You are limited to 50 clicks on this link per day. Also - do NOT spam this link - use it responsibly. Realm Alert Level This is a measure of how alert your realm is to sabotage and covert attacks. The levels represent a 10/20/40/70% increase in your alertness level, and a corrosponding decrease in your per turn income. Ontop of adding the stated percent to your covert score (only at the time of a covert incursion into your realm), they give the stated percent chance to see who was spying or sabotaging your realm, even if they succeed (whereas normally you would not know who did it). Alliance Management This link will take you to the alliance listings. Here you can: see who is accepting new members; view the alliances in the game by member counts, power, name, etc; apply to join an alliance; create an alliance (if you are not already in one); quit your alliance. If you are an alliance owenr, you can click you alliance name to get to your alliance management options like accepting members, requesting members to join, kicking members out, sending messages to your alliance, etc. % Income to Officers: If you are a commander, you can give a specific percent of your turn income to your officers each turn. The amount varies, up to 30%, and is divided equally amongst your officers. This setting also determines how much additional unit production you will get per turn - the more you give them, the more they give you. (although unlike income, it does not cost the officer to provide you additional units per turn - an example of the whole being greater than the parts). Accept New Officers: This checkbox determines if you are willing to accept new officers. If you are happy with your current officer/commander situation, you may want to NOT accept new officers. If you are not accepting new officers, the 'make this user my commander' option on the stats page (given after clicking a user name on the ranking or attack screen), is not available. See the Calculations section for the exact amounts you can expect to get from officers/commanders. Send Message This will open a window with which to send an ingame mail to this player. Reminder: Players can (if the message is insulting/crude) blacklist you so you will not be able to send them any more messages. Enough blacklists by different players, and the game administration is alerted. Crude/rude or personally threatening messages are illegal. Spy This option allows you to send intelligence agents into their realm to survey their stats and inventories. If you succeed (see calculations for what it takes to work) you have a *chance* to discover each of their stats. The higher your covert action above theirs, the more likely you will discover their secrets but it is not guaranteed no matter how high your covert. Multiple incursions are usually necessary to get all details. With spying and sabotaging, they will not know you were there unless: 1) you fail or 2) their defcon rate is high enough, and you unlucky enough, that they do notice you. Sabotage This option allows you to send covert agents in to destroy enemy weaponry. If successful (see calculations below) they will do an amount of damage equal to the difference between your, and their, covert action. They will keep destroying - weak weapons first - until either they are not powerful enough to take on the next weapon, or they feel they've destroyed enough at which point they return. All sabotage missions have casualties whether successful or not. See 'calculations' below for chance of success, and death rates. Both spying and sabotaging require 'covert capacity' listed on your base page, and which regenerates each turn. Additionally, if an enemy has been targeted with too much covert activity, your agents will refuse to engage, and let you know about the unsuitability of such a 'busy' target. Covert actions require surprise - too much activity forces the enemy to be extra vigilant and paranoid, and prevents surprise. Attack Attacking others is a core part of the game. As such, it is a fairly complex activity - or at least gets more complex as your realm grows. Attacking has 4 main aspects: Your Military Units, Your Mothership, Your Anti Covert Agents, Your Unique Abilities. Initially just military units will be relevent, but as you grow each of the 4 aspects will come into play. The 4 aspects are explained in order, although the statement: If your total strike action is higher than their total defence action, you win - always holds true. Be warned - your displayed stike/defence action is your natural maximum -- depending on the day, you will achieve from 75 percent to 100 percent of this potential. Additionally, the naquadah you gain on winning, is from 60 to 100 percent of 75 percent of their total open naquadah. Being at war with them adds 50% to your total, if both are at war it doubles it. (Be warned though that war is a minimum 24 hour commitment, and if they in turn declare war on you, the damage you suffer will greatly increase if they do so and attack back! ).You can see 'calculations' for how strike, defence, mothership, anti covert (again total potentials) action is determined, as well as death rates per unit type. Military Units: All Military Units are sent into battle, but only those with weapons actually make a difference (the rest stand around looking stupid, likely resenting you for your poor military management) - be it defence or offensive units. They will engage the enemy, with both sides doing damage. If your attack is greater than 20 percent or their defence (or their defence greater than 20 percent of your attack) the army will experience casualties. The larger your army, the more casualties. See 'calculations' for casualty rates. Additionally, any weapons used (regardless of enemy size) are partially damaged from use. In an assembly line manner, all weapons of the same type are treated to be as damaged as the most damaged weapon (ie no matter how many weapons you have of one type, they are all viewed as equally damaged). If a weapon type is damaged enough, it is 'scrapped' since repairing it would be more costly than buying new. Mothership Having a mothership can add to your attack and defence action but is only calculated at the time of battle, since the amount it can help is determined by both your, and your enemies, mothership. If the enemy has no mothership, your mothership weapon action (see 'calculations' for how this is calculated) is directly added to your strike or defence action, to a maximum of your total strike or defence action (it is for troop support so the more troops, the more it can support). If both sides have a mothership, the amount added is: Your mothership offence minus their mothership defence minus their mothership offence. In all cases your mothership will use its weapons to destroy first their mothership shields, then their mothership weapons, and finally - if you have any mothership attack left - it will add to your troops attack or defence. This is true of both sides. So - in short - you can stop an enemry motherhsip with enough shields/weapons on your mothership with shields obviously being more effective at stopping the attack. The more weapons you have on your mothership, the better chance you have at beating down their mothership and helping your troops. Shields do nothing for your troops, but do a lot to protect your mothership from enemy mothership weapons. See calculations for how damage is calculated. Anti Covert Agents If you have anti covert agents, they come into battle with you, in the attempt to kill your enemies covert agents/spies. They suffer damage based on the enemy military defence, and then must overpower the enemy covert action in order to kill spies. The amount killed is based on the difference between your anti-covert action, and their covert action, and how much time (turns) they have to spend. Also worth noting is if the enemy has no defence to speak of, your army (being bored) will assist your anti-covert activities, increasing their potential by up to 300% (making them 3x as powerful). See 'calculations' for the relevant calculations. Unique Abilities Each race has a unique ability. This ranges from raising enemy dead into your own ranks, doubling attack, completely avoiding an attack with fancy hologram technology, to regenerating your own dead units, to a blitzkrieg where you avoid any defence counterstrike. Your battle report will indicate if you or the enemy used any of these abilities. The higher their level in these abilities, the more often they will be used (see 'technology' section). Raid Raiding is an attack type that focuses on stealing untrained units, opposed to naquadah. A successful raid will get up to 1.5 percent of their untrained units (add 50% if you are at war with them, and 100% if both sides are at war), if full turns are used. Less time (turns) means less can be raided. The damage to troops, weapons and mothership is the same as a normal attack. When raiding, anti-covert agents are not used. Aside from these differences, raid is identical to attack as explained above. adds them to your enemies list on your ranking by relations (good for keeping track of them). Set Neutral Removes war and peace relationships from this user. Declare Peace Although this has no effects on battle or sabotage, it does mark them as '*peace' in the ranking such that if you have an agreement not to attack them, you will not forget and break the agreement. Declare All Out War* Identical to 'declare war' except that it affects you and all your officers, them and all their officers. Total Neutrality* Identical to 'set neutral' except that it affects you and all your officers, them and all their officers. Total Peace* Identical to 'declare peace' except that it affects you and all your officers, them and all their officers. Give Naquadah** Allows you to GIVE Naquadah to another player. This is GIVE - not lend, not trade. If you expect something in return, you are taking a large risk since the game cannot guarantee another player will honor an agreement made. Give Turns** Allows you to GIVE turns to another player. This is GIVE - not lend, not trade. If you expect something in return, you are taking a large risk since the game cannot guarantee another player will honor an agreement made. Give Untrained Military Units** Allows you to GIVE untrained units to another player. This is GIVE - not lend, not trade. If you expect something in return, you are taking a large risk since the game cannot guarantee another player will honor an agreement made. See the Calculations section for the actual numbers on the offensive actions above. The attack log records all attacks made by, and on your realm. It contains several pieces of information: the amount of turns used, quantitative result of the losses/gains, number of troops losses on both sides, damage done by you, damage done to you (if the damage of the enemy is too great, you can only tell that it was a LOT since you were busy running away), and finally a link to the official battle report. The armory is, as the name suggests, the place to buy and sell weapons of various strength and costs. The Armory is divided into two main categories: current weapon inventory and weapons purchase, along with a display of your Military Effectiveness and rank and your personnel such that you can balance weapons to units, and see the results of your changes on your military powers. There is also an option to buy a Mothership here - and when bought, to manage the mothership. Mothership management will be included in the armory summary, although technically it is not on the armory page (just linked to it). The Current Weapon Inventory (top of screen) lists your current quantity of weapons you own, separated into Attack then Defense Weapons, ordered by weapon power. You can fully repair each weapon type, partially repair each weapon type (input the number of points of repair desired), or scrap or sell your weapons (again input how many to sell if desired). Prices are listed for all activities. Tip: if you want to make a large purchase, consider selling some weapons to get the naquadah quickly. Weapons sell at a percent of cost, but can still be a great source of funds when needed badly. This is where you purchase your weapons. The weapons are listed in two sections (on the right column of the screen): Attack Weapons and Defense Weapons, sorted ascending by power. Weapon cost is cost in naquadah to buy it, the strength is the base damage it can do (which is multiplied by the unit power who holds it), and how much damage it can take before being destroyed. A weapon at 50% strength only does 50% of the damage it would at maximum. You will find that weapons that fall into disrepair get damaged more quickly than ones near or at full repair so it is worth keeping your weapons in good shape. The weapons types and prices differ for each race (see race advantages for an indication of who has better and cheaper defence or attack weapons). Motherships are purchasable for 450,000,000 Naquadah (prices subject to change, no guarantee to have one in stock). See 'attack' category for how they work in battle. You can name your mothership, and upgrade it in 2 ways: 1) you can add weapon and shield capacity. This does not add anything to the mothership except the ability to add more weapons and shields. 2) you can add more weapons and shields assuming you have the capacity. The price of capacity increases the larger the ship gets, but the cost of weapons and shields are constant. It is worth noting that covert actions can tell if you have a mothership or not, but can not say how powerful it is. Only battle will reveal that. Also of note is that motherships command their own rank - which is a combined attack and defence power rank - and so once you get a mothership, you will likely see your rank jump substantially. Motherships cannot be disbanded or sold, and upon ascending your mothership, its weapons and shields, are converted to Ascension Points but the capacity costs are not factored in. Warning: Anyone who names their mothership something offensive, is hereby warned that it may be blown out of existence by the 'admin superweapon' without notice or compensation. Untrained Units Gained each turn, based on your Daily Unit Production (and commander/officer bonuses if any), they contribute a small amount of income, and can be trained into most other specialized unit types. These units are the target of 'raids' (see attack section), and aside from mercenaries are the only units that can be transfered between players (see 'attack' section). Miner / Lifer These are your main income producing units. They are safe from raid, and produce a substantial amount of naquadah each turn (see the calculations section for actual income calculations). When unsure what to do with your units, this is the recommended answer - train miners. Be warned though, for each 10 miners you train, 1 will become a 'lifer'. A lifer is identical to a miner, except that it cannot be untrained. Also of note is that on ascension, lifers are the only unit to stay within your realm. They are, as their name implies, lifers in the mines. Super Attack Troops These are units who dedicate their life to become the most elite, most specialized, and most deadly offensive military units in your realm (often called 'supers'). They will fight on every attack (if they have a weapon), doing much more damage with it than an ordinary attack troop, and avoiding death much more successfully. These units are trained from Attack Troops and not Untrained Units. They cannot be untrained. Defence Troops These are units specialized in defensive battle. They will fight on every attack on your own realm (if they have a weapon). They will also suffer casualties, so it is good to keep a steady training of these units going -at least enough to match your defence weapons. Super Attack Troops These are units who dedicate their life to become the most elite, most specialized, and most deadly defensive military units in your realm (often called 'supers'). They will fight on every attack on your realm (if they have a defence weapon), doing much more damage with it than an ordinary defence troop, and avoiding death much more successfully. These units are trained from Defence Troops and not Untrained Units. They cannot be untrained. Spies/Covert Agents These are units specialized in covert actions including spying and sabotage. Thier power is determined not by weapons, but by your 'spy skill' (see below). Every covert action pits your covert agents/spies against those of the enemy. Although counter-intuitive, the more you send on any covert mission, the more your chance of success - since they will work together to create distractions, false leads, counter intelligence and overall confusion while the operation is carried out. Failure (or even success on sabotage) though, costs you a percent of those sent, so finding the perfect number to send to maximize success and minimize loss of agents is important. Your covert agents automatically defend against enemy spy and sabotage attempts (see calculation section for the actual chance of success/failure, and death rates.) Your largest fear on defence is anti-intelligence military troops (see below), and on offense is failure! Anti-Intelligence Agents These are units specialized in destroying enemy covert networks directly within the enemy realm! They are military units, are sent on each attack, but do not require ordinary weapons. Your realm anti-intelligence level (see below) determines the quality of both equipment and training of these troops. All units are automatically outfitted and trained when converted from untrained units. These units are targeted by the enemy army on attacking, and will also be assisted by your own offensive army if there is no enemy defensive army for them to worry about. With your full army assistance, your anti-intelligence (or anti-covert) power can triple! Intelligence (or Spy) Level This, along with Anti-Spy and Unit Production, are key stats since they can never be 'taken away' by enemies. This is a measure of how powerful each individual agent/spy will be - it is a multiplier for your entire covert force! The formula for how much each additional level increases your covert action is found in the calculations section, but needless to say it is significant. A high covert level (and enough agents) helps stop others from viewing your army and naquadah on the rankings, prevents successful spy attempts, and blocks sabotage attempts. It also allows you to more easily view the naquadah and army size of your enemies on the rankings. Overall one of the most important long term investments to do well, although it is also increasingly expensive to upgrade. Counter-Intelligence (or Anti-Spy) Level This is a measure of how powerful each individual anti-spy or anti-intelligence agents will be - it is a multiplier for your entire anti-covert force. The formula is found in the calculations section, and each upgrade is quite a bit more expensive than the last. A high anti-covert level (and enough agents) helps you bring down enemy covert numbers while attacking, makes you a feared opponent, and can be an integral part of larger teams like alliances or commander/officers. Unit Production This is the measure of how many untrained units you can generate per day/turn. Arguably THE most important stat in the game, since this will directly determine possible army sizes, income, covert, and indirectly determine weapon counts, motherships, etc - as all things require naquadah which these units generate (as do miners, which are trained from untrained units). This production can never be taken away by enemies. The cost of the next upgrade is always a bit more expensive than the last upgrade. Siege/Offense: Increases your entire attack strength by the stated total percentages. Fortifications/Defence: Increases your entire defence strength by the stated total percentages. Covert: Increases your covert action by the stated percentages. Anti-Covert: Increases your anti-covert/anti-intelligence action by the stated percentages. Unique: Each race has a unique ability. Increasing your technology in this area either increases the likelihood of successfully using that ability, increases the effect of that ability, or both. Mercenary: Mercenaries can only represent a fraction of your total military forces (your military advisors indicate that too many mercenaries would collapse your chain of command). Increasing your mercenary technologies allows you to increase the percent of mercenaries that you can command, without losing control. Currently, you can have an initial maximum of 25% mercenaries, with each upgrade adding 5%. All covert actions taken by you are recorded here. You can review any sabotage or recon mission via the 'details' link. You can also see a quick summary of the mission on the main Intelligence Log screen. Additionally, missions into your realm are recorded - at least all sabotage and failed recon attempts on you. Successful sabotage does not record who did it to you, and successful recon does not show up at all. The only exception to this is if your defcon rate is high enough to discover who sabotaged or spied on you in which case it is both recorded, and the enemy recorded. If you are missing weapons - check your Intelligence logs immediately, as you were likely the target of sabotage! The Market is a place where you can trade your resources for other resources, and is also a link for both the 'trade broker' - who can facilitate a player to player trade, as well as the mercenary marketplace where you can buy and sell mercenaries. The market trades in untrained unit/lifers, naquadah and attack turns. It has an exchange rate of untrained units (it buys untrained, and sells lifers), to naquadah to attack turns. The actual rate varies based on supply and demand a few times a day. To use the market you need either supporter status, or you can trade resources to get market supporter status, which allows full use of the market (but not the trade broker). There is also a limit of 3 market trades per week, a trade being defined as an interaction on the marketplace and not dependent on the quantity traded. Overall, depending on your current production levels, and short term plans, the market allows for a lot of flexibility in securing the right resources at the right time. The market broker is simply a facilitated trade between players. To use the broker, both players need supporter status. One player will offer a certain amount of their goods, for a specific amount of the other players goods. The goods are taken by the broker, and when the other party accepts, those goods are taken too and the two sets of goods exchanged and given to the respective players. A rejected trade returns the good to the player who instigated the trade. Be very careful of who you trade with, as deception is possible -offer a trade, ask you to instigate it, then reject the trade so the goods are returned to you -and then they attack you for the goods! The Mercenary Market is simply a place to buy military units for naquadah. The mercenaries are roughly equal to your normal military units, also require you to provide them weapons to fight, but can never be anything but mercenaries. You cannot train them further, nor untrain them, but you can sell them back (at a reduced price). It is worth noting that you can give mercenaries to your officers if you have them. A feature in the game allows for in-game alliances. These are groups of players, cooperating under the banner of an alliance. You can see a complete list of alliances off the base page, 'alliances' link. You can also form your own alliance here, if you are not already in an alliance. Worth noting is that if you have a commander, their actions in joining or quitting alliances will automatically carry you with them. Your allegiance to your commander goes before that of the alliance. If you form your own alliance, you cannot then take a commander as your allegiance has to be to the alliance. Alliances have no direct benefit, although their indirect benefits in support, knowledge, resource sharing and coordinated attacks can be quite large. You can tell a persons alliance via the [tag] after their name. Alliance Management If you control an alliance, you can get to the alliance management page by clicking your alliance name off the base page. Here you can accept members, request members to join, boot members, change alliance name, website and description. While alliances are mentioned elsewhere in this guide, they are a significant enough part of the game that they warrant their own section. Ascension is an evolved state of play, on both the 'main' level, and the ascended level. It opens up a new game (ascended.gatewars.com) as well as altering your main account. Requirements: To ascend you need a minimum of 1000 Glory and Reputation (G & R) points. These points are gained by being in the top 2% of all players in the rankings. (The top 2% of active players, so this number may be slightly different than multiplying the lowest rank by 2%). Each turn you are in this ranking, you get G & R points -more for the top .2%. Additionally, there are minimum stat requirements based on your unit production (and a minimum unit production) that are disclosed when you reach 1000 G & R points. At that point a new icon will present itself on your base page, and you can click that for more information. Ascending Although it is explained in greater detail at the time, it is common knowledge that ascending uses almost all of your realms resources to accomplish. Your weapons, technology, UP and covert levels, all units (except lifers), mothership, naquadah etc are all used up on ascending (and converted into ascension points (AP) for your ascended realm). You are left with your lifers, a 'free' supporter status, and a new evolved race based on your previous race. It is a new beginning. ReAscending: This works exactly as ascending does, except instead of getting a new account in the ascended realm, your existing account is 'powered up' and your main account gets additional bonuses. Main account bonuses are 5% per ascension (up to 30%) in each of the normal race stats, a different more powerful weapon set, and a unique technology that can call down your ascended being to assist you in this worldly battles -some of the time. How do Ranks work: Each player is ranked in each stat: attack/defence/covert (anti+normal)/mothership. You therefore have 4 ranks...1 is best, last is worse. A tie at the same value for last (ie everyone without a mothership). Your total rank is determined by taking ( rank1 + rank2 + rank3 + rank4 ) divided by 4, then sorting from lowest to highest. All 4 stats are therefore weighted equally in determining total rank, and dropping one by a lot will drop your total rank substantially. Having balanced ranks is the best way to climb the overall ranks. Seeing Naquadah and Army Size on Ranking/Attack Screens: Your Covert Action must be a fifth and a third of theirs, respectively. Income Per Turn: "Natural Income" is Untrained Units x 20 plus Miners/Lifer x 80 per turn x race bonus (25% for Goa'uld). Bonuses: 10% more for having no commander. 10-30% of commanders income, based on their officer income rate, divided by the number of officers they have. Untrained Units Per Turn: Your 'natural' per turn units, are your daily unit production, divided by turns per day. You get a 20% bonus if you are your own commander, 10% bonus if you have no commander, and if you have officers, each officer gives you one half of your officer income rate percent of their unit production (on top of their full production going to them). Strike (Defence / Covert / Anti-Covert / Mothership) Action: You can find a breakdown of these statistics on your personal 'Explanations' page, which details various contributions made to your power. In general, the rule is "('number of soldiers/agents' * 'amount and quality of equipment') + relevant contributions". Mothership Action: This is simply the sum of total mothership shields x shield strength and total mothership weapons x weapons strength. You can tell the strength of one shield/weapon by buying just one, and seeing how much your mothership attack or defence goes up, since there are no other bonuses to motherships. Realm Alert Level Settings/Effects: None/Low/Med/High/Critical have values of 0/10/20/40/70%. Each percent adds that much to your covert level (on covert attack on your realm only - not while 'just sitting'.) It also reduces your income by that same percent. Ontop of all this, if you are successfully spied or sabotaged, it will give you that same percent chance to catch who did it, even if it does not stop them. Spy Success Calculation: Your Covert Action (based on agents SENT) must be greater than their Covert Action (times defcon percent)-100, divided by your Spy Level+2, divided by 2. Spy Death Rate: 20 Percent of spies/agents sent when operation was unsuccessful. None lost on success. Sabotage Success Calculation: Your Covert Action must be higher than their covert action (adjusted by their defcon rate). Sabotage Damage Calculation: Your Covert Action minus their covert action (adjusted by their defcon rate) to a maximum of 5900 weapon power, or 2 percent of their total weapon power -whichever is greater. This is doubled if both parties are at war. The damage goes from lowest strength weapons, upwards, destroying as many as possible until you have no damage potential left, or your damage potential left is smaller than the strength of the next weapon. 5 Percent of spies/agents sent when operation is successful. War (attack/raid) Success and Winnings: Your Strike Action (which is from 75% to 100% of your total potential Strike Action as determined above), must be bigger than their defence action (which is from 75% to 100% of their total potential Defence Action as determined above. Winnings are up to 75% of their naquadah (or 1.5% of untrained soldiers on raid), for a full 15 turns. Each turn less than 15 used obviously takes 1/15th of that potential away. Being at war with them adds 50% to these potentials, while if you are both at war, it doubles. War (attack/raid) Military Unit Death Rates: For a full 15 turn attack, 3% of your normal attack units can die (2% of defence units), while 1.5% (1% of defence units) supers can die. If you are at war and attacking, attack unit deaths are multiplied by 1.5. If both sides are at war, each is doubled. On top of this, defence unit deaths are multiplied by strike action/defence action and attack unit deaths are multiplied by defence action/strike action (there is a min/max of 10%/500%). Attacking at less that 20% of enemy defence causes no deaths to the enemy. War (attack) Anti-Intelligence Military Unit Death Rates and enemy Covert Agent Kill Rates: The base value for 'anti-intelligence power' is your anti-covert power minus their covert power. If they have no defence, each 2 normal military units, and each super, counts as an additional anti-intelligence unit - to a maximum of 3 times your anti-intelligence unit count. This amount is then multiplied by turns used divided by 15. This again is your base anti-intelligence power. To determine how many enemy agents killed, it is your power from above, divided by their total covert divided by the number of spies they have (ie your power left divided by thier power per spy), up to a maximum of 3% of their spies on a 15 turn attack. The amount of anti-intelligence units you lose (win or lose the attack is the same) is their defence power divided by your power per anti-intelligence agent to a maximum of 3% of your anti-intelligence agents. This means using anti-intelligence on a stronger defence force loses more anti-intelligence agents. Market Turns+Donations: 6 per week. PPT Bonuses: 2 per week. You cannot attack someone who was last attacked from your location/IP address but not by you. NewGrounds Main account without Supporter Status? Any account with Supporter Status but neither ascensions nor donations loses their status when they come off vacation mode, for reasons of Fair Play. While this guide was correct at the time of writing (this guide IS NOT a guarantee), and will be updated periodically, the newest features, changes or enhancements are announced in the 'game updates' page, linked off the top left navigation. This navigation also has links to the other game servers, forums, chat room, and other places of interest.